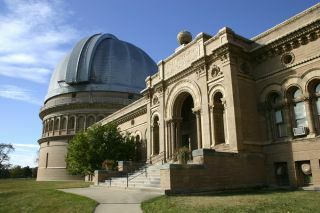 Yerkes Observatory was built in the late 1890s in Wisconsin. It houses the world's largest refracting telescope. Yerkes Observatory is a 77-acre facility in Williams Bay, Wisconsin, that houses a 40-inch (100 centimeters) telescope, the largest refracting telescope ever built. The observatory is noted for its work on stellar motion and cartography. It is also where astronomer Gerald Kuiper discovered that Saturn's moon Titan has an atmosphere. Plans for the observatory, which is operated by the University of Chicago's astronomy and astrophysics department, began in 1892, when a new professor, George Hale, learned that twin 42-inch mirrors were available. If put together, the mirrors could be used to create a 40-inch telescope. Hale and Alvan Clark, a telescope maker, persuaded a Chicago streetcar businessman named Charles Yerkes to finance the construction of the observatory. Yerkes granted them $349,000 (roughly $9.8 million in 2014 dollars), and the first observations were made in 1897, according to the National Park Service's Yerkes website. The new observatory "represented the wave of the future and established the modern observatory as a research institution where the astronomer, using the disciplines of chemistry and physics, supported by engineering and optics workshops, could apply his talents to the understanding of the wonders of the universe," a book published on the NPS website stated. For Hale, the new facility represented an opportunity to do high-quality observations of his preferred observing target, the sun. He invented the spectroheliograph, which allowed him to identify the elements in the sun using the science of spectroscopy. "With this instrument," the Yerkes website stated, "he proved that calcium and hydrogen flocculi [the bright or dark patches] seen on the solar disk were vast prominences thrown off by the activity in the sun's outermost layers." But Hale was also enamored with the idea of combining the discipline of the hard sciences with observations of the sky, and by doing so, he made Yerkes among the first facilities to do modern astrophysics. This pioneering effort brought a few prominent astronomers to Hale's door. For example, Sherburne Burnham was keeping track of double stars through observations that began at the Lick Observatory in California and then continued at Yerkes. In 1906, Burnham published a catalog of 13,665 double and multiple star systems within 121 degrees of the North Pole, which was considered a huge advance in that field of astronomy at the time, the Yerkes website states. Another astronomer who came to Yerkes was Edward Barnard, whose "Photographic Atlas of Selected Regions of the Milky Way," is described by the Yerkes website as "a work that remains a landmark in the study of our galaxy." Barnard studied Earth's home galaxy between 1905 and 1927, plotting any dark clouds that obscured the stars from view. Hale, who was always eager to push astronomy frontiers, began searching for other locations to do his research. In 1903, he went to California and examined Mount Wilson as a possible location for an observatory (and he ended up following through on this idea). Hale then invited the researchers at Yerkes to follow him to California. While some did, research at Yerkes continued, the website stated. Edwin Hubble, for whom the Hubble Space Telescope is named, began his work photographing hard-to-spot galaxies at Yerkes. Along with his continuing work at Mount Wilson, this laid the foundation for Hubble's measurements of the universe's size. In the 1940s, Yerkes also became noted for its moon discoveries. After astronomer Gerard Kuiper came to the facility, he found an atmosphere on Saturn's moon Titan. That satellite still intrigues astrophysicists today, because it hosts hydrocarbons such as methane and ethane, which are considered complex molecules that could be precursors to the chemistry that is necessary for life. Additionally, Kuiper discovered Miranda, the fifth moon of Uranus, in 1948 and Nereid, Neptune's third-largest moon, in 1949. In 1951, Kuiper predicted the existence of a belt of icy objects in the outer solar system that now bears his name. Other astronomers who worked at Yerkes include Frank Ross, who examined interstellar matter; Otto Struve, who studied the atmospheres and rotation of stars; and William Wilson Morgan, who measured the distances and luminosities of stars, which eventually revealed that the Milky Way is a spiral galaxy. Today, in addition to the 40-inch refractor, Yerkes has two reflecting telescopes, a 24-inch (61 cm) and a 40-inch (100 cm) scope. The observatory places a big premium on education for its visitors. It holds regular star parties and family nights to appeal to all ages, and also has programs available for up-and-coming astronomers. The Yerkes Astrophysics Academy for Young Scientists provides day camps for students in grades 5 to 8, and is a part of the Skynet Junior Scholars network, which provides telescope access to students in those same grades. Work experience is available for high school students, and teachers can take part in workshops. "Education is the foundation for success," Yerkes stated on its website. "Yerkes is a wonderful place to experience hands-on science and engineering, especially for our younger generation. The goal of the observatory staff is to ensure that these opportunities continue year after year." Yerkes also carries out a research program of looking at how stars have moved over the past century. It has a vast collection of photographic plates showing star locations to high precision, making it possible to do comparisons from the early 1900s, the observatory stated. This work is also helping to calibrate the Sloan Digital Sky Survey. "Professor Kyle Cudworth [of the University of Chicago] and his collaborators have been concentrating on such measurements for star clusters containing the oldest stars in our Milky Way Galaxy. The general goal is to increase our understanding of how the galaxy formed and how it has changed since it formed," Yerkes stated.